This wedding portrait at the St Regis Punta Mita reminds me why it can be so special for the bride and groom to see each other prior to the ceremony. Having a First Look allows couples to connect privately before their public display of love and enjoy some time alone together on their wedding day. It also allows us to have time to create meaningful portraits without the pressure of rushing to the reception. For this Persian couple, spending time with all the guests who joined them in Mexico for their destination wedding was very important; they wanted to mingle with their friends and family during their cocktail hour and enjoy the entertainment and dancing during their reception. But they also wanted to have time to create creative portraits in the different areas of the St Regis. The solution was to see each other prior to the ceremony in order to have additional time for photography. This image was taken near the spa at the St Regis. We positioned the bride so the sunlight naturally lit her face and the back of her beautiful dress was highlighted. 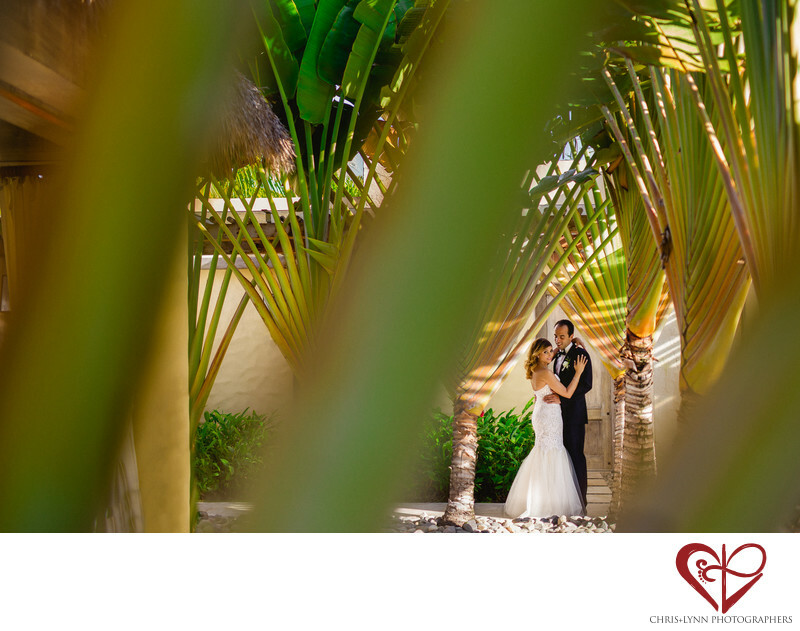 To frame the couple and balance the composition, we shot the image through palm fronds on the opposing side of the spa. I love the tropical feel of this image and the way the groom is looking at his beautiful bride with such love. For more reasons why a first look might be right for you, see our FAQ here. Location: The St. Regis Punta Mita Resort,Carretera Federal 200, km 19.5, 63734 Punta De Mita, MX-NAY, Mexico.